PRODUCT: 1/8 x .188 - .250 (3/16 - 1/4") GRIP, LARGE FLANGE, PLATED ALL STEEL BODY/ MANDREL, BUTTON HEAD (OPEN/DOME), BLIND POP RIVETS. 500/BOX. PRICE/BOX. PLATED STEEL BODY AND MANDREL. Large flange Steel/Steel rivets provide a greater bearing surface for fastening soft and brittle facing materials and with oversize facing holes. 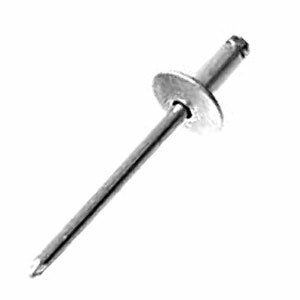 High-shear steel/steel blind rivets are tough and reliable, and can handle vibration without loosening or falling out. These rivets meet or exceed IFI 114, Grade 30 specifications. Strong steel rivets works well where the increased flange diameter protects the integrity of the application. Conform to IFI specification 114 and are quick and easy to install with hand or power tools. Flange / Head Diameter: 0.375"
Material - Body/Mandrel: All steel, zinc plated with a clear chromate coating.